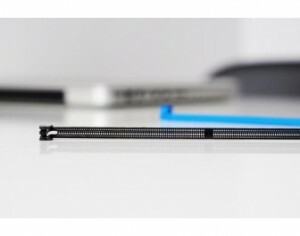 Royal DSM, a material science company based in the Netherlands, offers its Stanyl ForTii halogen free, high temperature polyamide (PA) for next generation DDR-DIMM computer ram sockets. According to DSM, major Original Equipment Manufacturers (OEM) have started to use DDR-DIMM sockets in the latest generation of blade servers, which require components with low height, for example, to compensate for the use of dual in-line memory modules incorporating a higher number of chips (high density DIMMs). Low component height and less “real estate” allow easy rework at lower temperature loads, create fewer heat traps, and provide better thermal airflow. The new servers also need less Printed Circuit Board (PCB) keep-out area, enabling higher component density due to reduced latch-actuation angles. In addition, specifiers demand plastics that are entirely free of flame retardants that are halogenated and/or contain red phosphorous. Furthermore, manufacturers want to use different colors for housings and latches, to provide DDR-DIMM socket differentiation. The long form factor of the sockets, together with possible mismatch in coefficient of linear thermal expansion (CLTE) between FR4 (glass-reinforced epoxy laminate) PCBs and the housing material, presents a high risk of system warpage, making the challenge for any Ultra Low Profile (ULP) or Very Low Profile (VLP) socket material particularly severe. DSM says its Stanyl ForTii has been selected for a new generation of ULP DDR3 sockets after tests were carried out on it alongside various liquid crystal polymers (LCPs) and polyphthalamides (PPAs).Stanyl ForTii is a high temperature material with high flow, combined with DSM’s in-house technologies on halogen free flame retardants and solutions for lead-free soldering, thereby offering a greener solution to the problem of e-waste.